Fishing is to not only go in the water and catch fish. It gives a feeling of full refreshment and adventure. When one starts fishing then it will go on and on, it is really a good outdoor activity for anyone. As there are so many kinds of fish to catch, here I will talk about how to catch sturgeon. To catch this beauty you will have to go into rivers and lake. Catching this fish is becoming very much popular among fisherman. In the lake water, this fish is plenty in number and can be caught easily with food. You have to own proper gear and rig to catch this fish. You have to know which one to take or not. in a word it needs some research and guide to catch this fish. So let’s get ready to learn about catching sturgeon. Stay with me. 2. Where will you find them? If you want to start your fishing with a huge freshwater fish, then sturgeon is the best choice. Normally in the lake, the sturgeon tend to grow up to 6” long and over 100 pounds. Yes, it is huge. It is also strong and gives a tough fight with the fisherman. This fish grows slowly and maturity comes after a long year. Female sturgeon takes 25 years to be mature and to be 55” long. Their spawn time is springtime and this period comes only after 4-5 years. Males take time for 15 years to grow mature and 45” long. So when fishing the sturgeon you need to follow the catch and release rule. So you have to be careful about the gears and rigs to keep the catch secure and unharmed. Because if you left it harmed or injured than it may die later. Try to keep in less pain before releasing it. Sturgeon fish is the bottom feeder and they have the mouth like a vacuum cleaner. So all of your catching equipment should be perfect for a bottom waterbed. As for bait, night crawlers are the best bait to catch this beauty. But other fish don’t like this bait, so they tend to throw away the bait. So be alert and check the bait if it is in place or not. Try redhorse or suckers as bait. Cut and stick them in the hook, they will attract the sturgeon and try to stay on the hook for a long time. After, 15 minutes check the bait and use a fresh bait to get effective result. Don’t be in confusion to use different types of bait and rigs. It is fun and you will get different experience while using different kinds of baits. Who knows you will grow into experienced bait maker. You can do a big business with it. Because selecting or making proper bait is not a simple thing. You have to be creative and smart to make proper bait for your fish. Low light is the best time to catch sturgeon fish. Go for fishing in early in the morning and in the light evening. You can also fish in the night but in the night, you will also have to face more night loving fish. Stay safe and alert in the nighttime. Make sure to use light in the boat and keep an extra secured weapon to fight with unwanted guests. As the sturgeon fish is river fish. This fish likes to live in a deep hole, current breaks, eddies, weed edges, and shelves. They come to these places to search for food. To fish, try to use 7-9 ft. long fiberglass rod. This rod helps to hook, fight with the surgeon. As for reels, you can go for baitcasting or spinning reels. With a spinning reel, you can backreel and fight with this fish strongly. With baitcasting reel, you can detect bite and it has the power to fight with sturgeon fish. After catching the fish, use a landing net that is Musky net. It will help you to keep the fish near water while you are unhooking it. After removing the hook, if it is small sturgeon fish grab it behind the head and if it is a large fish than grabbing it by the tail fin. An old fisherman uses a knot name slip knot. Use this knot around the tail. Then release the fish into the water. As the sturgeon fish is a strong fish, so try to keep it calm before clicking the picture and release it. Just hang it with power and care. While using live bait, the river bed tends to get dirty. If possible take lots of wet towels and take rain pants. When you are free, try to keep clean the riverbed. It is only for our good. Sturgeon fishing is not a glamorous sport. Using live bait can be downright dirty. Carry plenty of towels in the boat and wear rain pants when possible to keep clean. Before going for fishing you have to be ready with equipment and preparation. If you are new then you need a local guide to help you to take preparation. Because sturgeon is not easy to catch if you are new. You have to own perfect rigs and gears. If you have the boat and tackle then use a strong line, reels, and rods. The best gear is Muskie gear. As this fish is a strong fighter, so this gear helps you to stay strong and catch the fish quickly. In the rig, you can set up an 18” cell and 5/0 circle hook with night crawlers. If you did with this setting, man you are ready to catch this fighter. If you have the boat then your fishing experience will get a good experience. If you have to fish from the boat then you have to own 7-8 inch rod. Make sure the rod is sensitive and flexible. You can also fish sturgeon in the shore. There are many spots where you can fish sturgeon easily. Remember for the first time you may have to waste time and lose some gear. But while losing you may hit the golden hole where the sturgeon stay and trust me you will find them in bundles. To fish in the shore you will need an 11-12” rod. This rod can bear 18-pound fish. The reel has to be baitcasting reel. Make sure it is best in quality and has enough power to catch this sturgeon fish. The sturgeon fish loves to swim around in the lake water. The best time to catch them is when they are in the shallower water where they will find food. In their feeding time, they come out from the deep hole. Be ready with your tackles in the river mouth. Sturgeon fish likes to move. They move to get food, to find a comfortable place. It is quite hard to locate them. There is a device to locate this fish easily when they are in moving mood. The device is the fish finder. Once you know how to operate this device, it will be easy for you to catch a sturgeon even it is moving. • A perfect tackle to carry 100-pound weight. • Thick gloves to protect the hand from razor piercing projections of small sturgeon. • Pliers to remove the hook from the mouth to let the fish go without any harm. • A measurement device to measure the fish length. • While measuring calm the fish by placing a wet towel on the fish head. 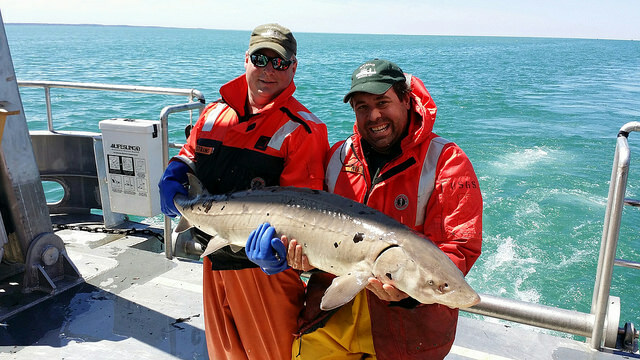 The best seasons to get sturgeon is from April to September. These seasons are proper for catching sturgeon. To catch a sturgeon, try to use fresh bait. Because the bait that is old loses its slime coat smell, blood, and freshness. For this reason, sturgeon don’t get attracted to your bait. So when you are in the fishing mood, use fresh bait to catch a big sturgeon fish. As you know sturgeon fish is a moving fish. So when you are on your boat do roam and try to catch this active fish. When you have in one place for 15 minutes and still you are not catching fish, then it is high time to move on and go to a new place. Now to the important point, following the correct steps to catch this fish. Using correct tackle gear: The fishing rod has to be 6-9 feet long and single piece. Reel of the fishing line has to bear up to 80 pounds. Take 5/0 to 9/0 size hook to fish. Attach the right bait: Fresh bait is highly recommended to catch sturgeon. The best baits are salmon eggs, crawfish, shad and freshwater clams. Sometimes you may not find fresh bait. That time use scent to make it smell like fresh bait. This will attract the sturgeon. Fix the spot: You can fix the catching spot by observing the tide. If there is no tide then go to deep water and if the tide is in the water then you will get the good catch in the water small bed. Observe the bite: You can tell the fish is ready to catch or not by the bite. In the cold weather, you will feel the fish bite is slow and tiresome. This can tell you the fish is not ready to catch. But in warm weather, you will see the bites are strong and violent. It indicates the fish is near to spawning time. This the best time to catch the fish. Don’t hurt the fish: When the fish is on your hook, try to pull up the fish soon to secure the fish and make no harm. Because if it gets hurt then it may die. Just follow the steps properly, this beautiful fish will be in your hand. • Use a sharp hook to catch this hard mouth owner sturgeon fish. Pick razor-sharp hook to catch the fish. • Pick the perfect location where you will find lots of sturgeon fish. If the fish are not hungry they will stay in the deep hole and if they are hungry then they will in a shallow place. • Use lightweight bait to catch this fish. You have to ask why this fish is so important to catch. Well, this fish has omega-3 fatty acid, EPA, and DHA. Also, this fish is rich with collagen, chondroitin sulfate, amino acid, and carnosine. All of these ingredients are too much good for human health. It is not mandatory to catch sturgeon fish to eat. You can also play the game of catch and release. This process helps you to be professional in fishing. So when you are thinking about this process, make sure you not to harm the fish. Or else it may die or fatally injured in the process. So here was the whole process of how to catch sturgeon. I know I was giving lectures and lectures. But trust me it is from my personal experience. If you read and follow all the steps properly, it is a guarantee that you will get a bundle of fishes in no time. Just take proper rigs and tackles to catch this big fish. But you have been calm and powerful when you are catching this fish. Because you have to control yourself and powerful when this fighting to go away. As I said before it is not just an article, it is an experience in words. Sturgeon fish is river fish. This fish likes to move and move. You will have to be alert and experienced to get this fish. At first, you will lose some fish but after giving some time you will get to know about this fish a lot and you will own some sturgeon a lot too. Just stay focus and enjoy the fishing.